The NSpec Q4 Series low voltage downlight has a square aperture and housing. Three reflector styles available: 4-inch square adjustable frosted lensed (wet labeled); 1.5-inch square adjustable pinhole; and 3-inch-square open adjustable reflector. 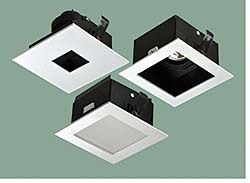 Die-case aluminum lamp holders help dissipate heat and can accommodate two filters.